Current Club: None - now goalkeeping coach at Atletico Nacional. Previous Clubs: Pereira, Deportivo Rionegro, Guaros de Lara, Aucas, Pereira, Junior FC, Real Cartagena, Independiente Medellin, Veracruz, Atletico Nacional, Real Valladolid, Atletico Nacional, Millonarios. International: Colombia 68 caps 3 goals. Trophies Won: Copa Libertadores 1989, Copa Interamericana 1990, Colombian League 1991, 1994. Higuita is a legend of the game, though better known in the UK for his 'scorpion kick' save from Jamie Redknapp against England at Wembley in a friendly match in 1995. There was so much more to Higuita than that save though, it seems unfair to remember such a great player for just one moment. This is a man who inspired a whole generation of keepers, as well as being the basis for the tactical revolution that led to Pep Guardiola's tactical masterplan. The Colombian, nicknamed 'El Loco' (the madman), was extremely eccentric and often lived up to his billing with some bizarre moments, such as trying to dribble past Roger Milla in the 1990 World Cup, only to lose the ball to the Cameroon forward, who then scored the goal which knocked Colombia out of the quarter-finals. However moments like that came as part of the package with Higuita, whose all-round play more than made up for the odd mistake. He was the inspiration for future goalscoring keepers, such as Jose Luis Chilavert, with his free kicks and penalty kicks, which were highly regarded at the time. The confidence he possessed was almost unshakeable, he lifted the team around him and helped them shed the nerves that can otherwise see a team freeze on big occasions, such as the 1994 World Cup. With Higuita absent, following a spell in jail, the Colombia team bottled it out of pure fear, with the country in turmoil due to a drug war and numerous death threats having been received by the team. When Higuita was playing the team had no fear, his mere presence was an inspiration to those around him. He was absolutely fearless and that rubbed off on teammates. Added to that quality was his style of play, the first true sweeper keeper, who looked to play out from the back when he swept up, rather than just being further forward to clear up balls played over the top. Higuita was the first footballer to play in goal, turning a team into 11 footballers rather than 10 footballers and a keeper. His teams could play a high line when defending, knowing balls knocked in behind them would almost invariable be cleaned up by him. When in possession of the ball, having Higuita in goal meant the defence could stay up higher, knowing they could use him as an out ball and it would not mean the ball would just end up being lumped up the field. 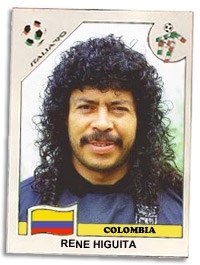 Higuita was a huge part of the short passing game Colombian teams favoured. Higuita was also capable of turning defence into attack by dribbling past a forward and moving forward with the ball. We often see how a centre back moving out of defence with the ball at his feet can cause havoc, no one knows who should be dealing with him and they can often travel right into the attacking third while the opposition players all wait for someone else to close them down. The keeper doing it had a similar effect, maybe even larger, as opponents had no clue how to deal with it. No one wants to leave their man or their area of the pitch to deal with an onrushing keeper! While Higuita will forever be remembered for that save, it should not be forgotten that his emergence has revolutionised the game and paved the way for the way the modern game has gone. That may sound like a big, overblown, claim, but it is true, Higuita changed the game and for that he should always have a legendary status in the world of football.